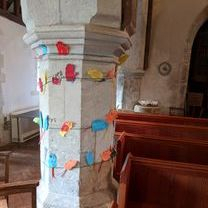 In early 2018 Rust & Stardust collaborated with Reverend Peter Blee at St Michael and All Angels Church, Berwick, on a term-long arts and education project with Alfriston Primary School. 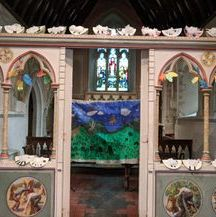 St Michael’s is best known for its beautiful biblical murals painted by the Bloomsbury set, and features paintings by Vanessa Bell, Quentin Bell and Duncan Grant. 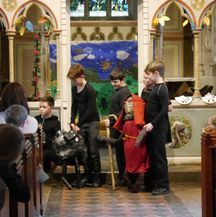 The aim of our project was to inspire and work with Year 5 and 6 children to create and perform their own puppet theatre performance in the church, keeping the themes and colours of the Bloomsbury murals in mind. 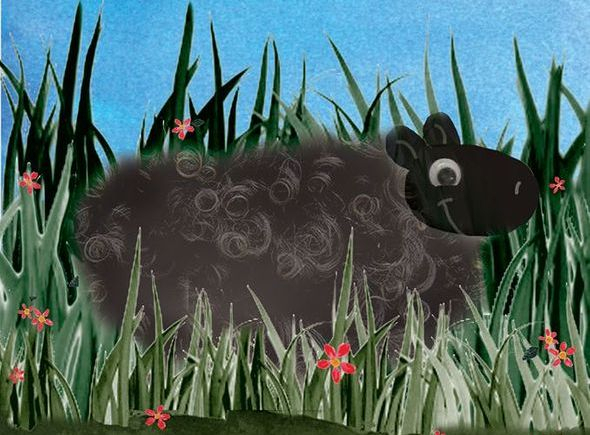 To discuss running The Lost Sheep project with your school, youth group or Arts Award students, please do get in touch. Email us at rustandstardustproductions@gmail.com to find out more and tailor the project to your requirements. The project began in January. We created a short performance based on a biblical theme, using the Parable of the Bridesmaids and the Lamps as a starting point (the subject of a dramatic painting on the back of the rood screen at St Michael’s.) 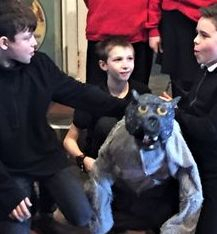 Our show included storytelling, simple props, puppetry and live music and song – all elements we would be introducing the students to. After the performance, we led two classroom sessions with Emerald Class, answering questions, introducing them to some of our puppets, and discussing how we begin working on brand new projects – from character design to adapting stories, and leading into some basics of puppet building. We were really fortunate to be involved in this project, and thank you to Reverend Peter Blee from Berwick Church who introduced us to Rust & Stardust. It was different to any type of performance we'd ever seen or been involved in before. Eleanor and Katie, right from the start, built really good relationships with all of us and were always professional. 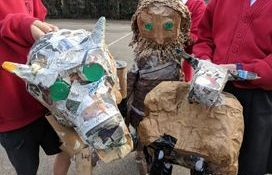 It was brilliant to use one of our whole school creative days to get all the children involved in making the props and scenery for 'The Lost Sheep' performance. The actors loved working with Katie & Eleanor and the life size puppets that they made together during the after school workshops. It all culminated into a really amazing performance, making us all proud! An after-school club continued weekly for the ten students who would be involved in the project. After exploring story possibilities and considering those shown in the murals, the group decided to use the Parable of the Lost Sheep as a starting point for their own short play. 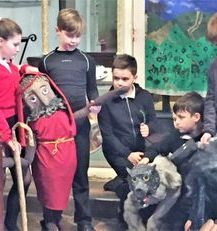 Reverend Blee helped explain the themes and message of the story, and the children decided to add a character to the story – a wicked wolf who is eventually redeemed. The adaptation also drew resonances from the Prodigal Son story. 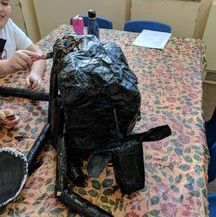 Over the next few weeks, the children worked in three small groups to make the puppet characters of the little black sheep, the kindly shepherd and the wolf. 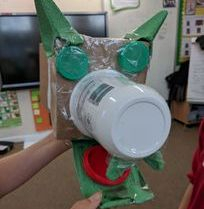 They were very enthusiastic about using recycled materials to create the puppets, and brought in all sorts of things to re-use – from toilet rolls and cat food boxes to a furry wolf onesie! 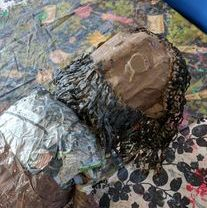 With our support, the children constructed the puppets’ bodies and mechanism, then decorated and filled them out with paint and paper mache. The puppets were awesome! We had to be careful when handling them and we learnt how to use them so that they behaved as if they were real! It was great working as a team to create the performance. In the middle of term, we led a whole school creative day to make set and props for the show. 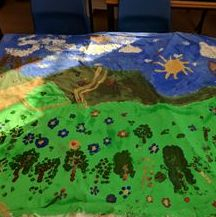 Every pupil in the school contributed, working on a carousel to paint a beautiful backdrop, make a colourful forest and town, and construct the ninety-nine sheep which stayed safely at home. 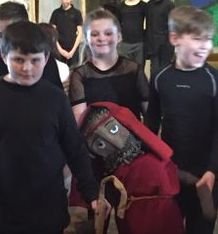 When the large puppets were built, we worked with the children to adapt a script from the parable, which they learnt and rehearsed, using their new puppetry skills. 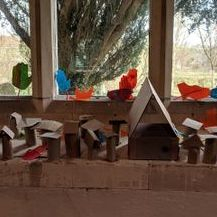 The children were inspired by the whole process of making, creating and performing. 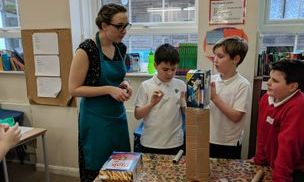 Katie and Eleanor passed on their own passion and enthusiasm to the children and taught them a great deal about the creative process. All the children contributed through the ‘whole school creative day’ and felt involved in the project. The children loved working with Eleanor and Katie and were sad when the project came to its conclusion. 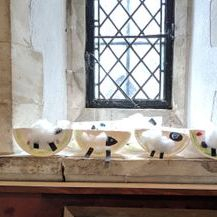 The project culminated in a performance of The Lost Sheep at Berwick Church, decorated with the set and props the school had made on the creative day. 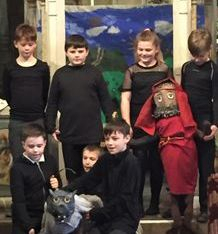 The children told the story, sung all the music live and performed and puppeteered the characters. 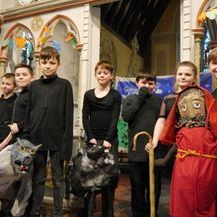 The puppets, sets and props were exhibited afterwards in the church. It was really fun, messy and sticky! We had a script but we did a lot of improvisation, which was fun! 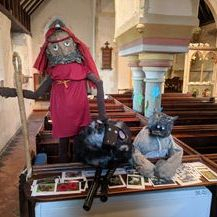 Our thanks to Reverend Blee and Alfriston Primary School for facilitating this fantastic project and allowing us to work with the puppeteers of the future! 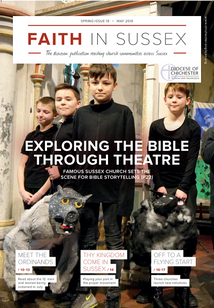 The Lost Sheep featured on the cover of the May 2018 issue of Faith In Sussex, with an article inside about the project. The Lost Sheep project is available as an entire package for schools, churches, youth groups and similar. To discuss your requirements, please do contact us. The project supports Discover, Explore and Bronze Arts Award qualifications.